In South Sudan, People Are Dying Of Hunger As Civil War Continues : The Two-Way The U.N. says nearly 5 million people do not have enough food, and it issued a formal famine declaration for Unity State in the north-central part of the country. A World Food Program food distribution site in Bentiu, South Sudan. The U.N. says nearly 5 million people in the country do not have enough food, and in one region people are already dying of starvation. The United Nations says people are dying of starvation in north-central South Sudan, and it has issued a formal famine declaration for part of the country. In all, nearly 5 million South Sudanese people do not have enough food, according to the U.N.'s food security arm, and that number is expected to rise to 5.5 million by the agricultural lean times in midsummer. Of those, at least 100,000 people are at immediate risk of starving to death. "The magnitude of these food insecure populations is unprecedented across all periods," a new report warns. UNICEF estimates more than 1 million children are malnourished across South Sudan. "If we do not reach these children with urgent aid many of them will die," said Jeremy Hopkins of UNICEF. "[The war] began as a primarily political conflict, but has since taken shape between the country's two largest ethnic groups, the Dinka and the Nuer. At that time, South Sudan President Salva Kiir fell out with his former vice president, Riek Machar, over allegations of a coup attempt. Kiir, who is Dinka, and Machar, who is Nuer, gathered supporters from their respective tribes." 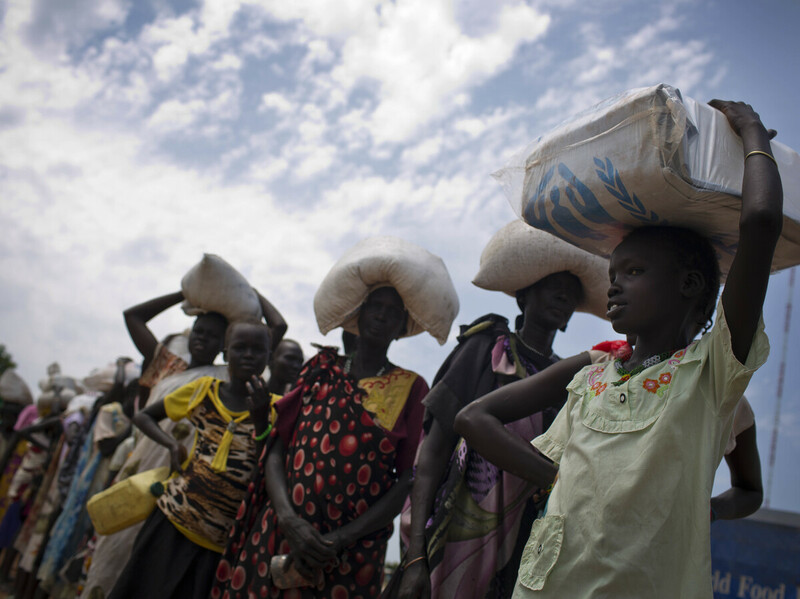 Aid work in South Sudan has gotten more and more dangerous and difficult. In July 2016, aid workers reported having been gang-raped by South Sudanese soldiers who attacked a hotel in the capital, Juba. In December, one of the largest international aid groups working in South Sudan was expelled from the country, as NPR's Jason Beaubien reported. "In the last few months, aid convoys and warehouses have been attacked, both by the government and by the rebels," Jeffrey Gettleman of The New York Times told NPR's Morning Edition. "[In 2011] there was so much hope and unity and a sense that this country was embarking on a future together. And in the last few years, that's all crumbled. Right now, we're seeing this conflict spread across different areas of South Sudan that had been relatively peaceful. "The problem in South Sudan is that it's a very weak government, and you have tens of thousands of young men that know little else except how to fight and how to wage war. ... It's a political problem. It's the fact that much of the country is resisting the government and that the government is responding very brutally." In December, the U.N. warned that South Sudan was on the brink of genocide, and the U.S. called for an arms embargo on the country. The embargo failed to pass the U.N. Security Council just before Christmas, in part because ambassadors from Japan, Russia, China, Angola, Malaysia, Venezuela, Egypt and Senegal all questioned its potential efficacy and abstained from voting. History is going to be a very harsh judge of their decision," former U.S. Ambassador Samantha Power told the council following the vote. "The atrocities in South Sudan, the displacement to other countries is increasing every day." "It's basically a cry for help," Gettleman said of the U.N. famine declaration. "The U.N. is saying we're desperate here. We need resources. We need cooperation. We need more involvement by other countries to really push the government to do something about this."